Sorry I’ve been MIA for awhile. Between surgery, my grandma’s death, and school, I’ve had a lot going on. I’ve spent most of my weekend downsizing the amount of junk I have (sometimes I don’t understand I how I accumulate so much stuff) and organizing. I partly blame it on Flickr because all I keep doing is looking at pictures of the insides of other people’s houses. Then I see things I want to do and go on a crazy organizing spree. And then of course a trip to IKEA happens, which was yesterday’s scenario. Today was just laundry and catch-up-on-homework day. 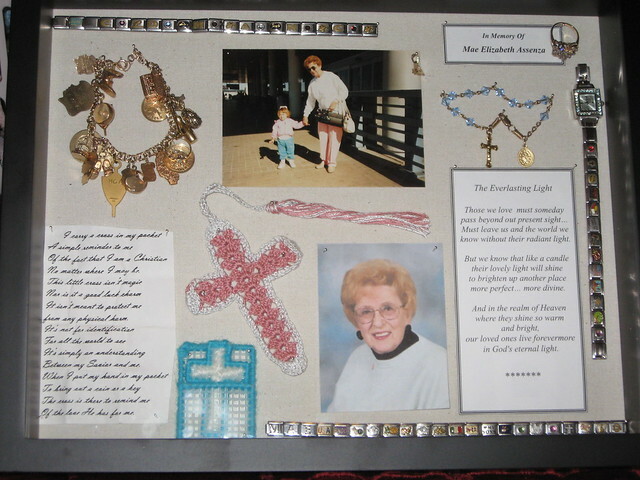 In other news, I put together this shadow box housing my trinkets of Nana. I don’t have the courage to wear any of the jewelery I was left by her, so I decided to make a little shrine to her. And yes, that picture above is me when I was about 2 years old with my Nana. ❤ It is going to be a very sad holiday season. The first holidays without my Nana.